Faith brings her running skills to iPhone. Mirror's Edge was one of 2008's freshest and most attractive games. We loved the parkour style gameplay, as well as the overall theme of sticking it to the man. Now we can enjoy a small piece of it on the go, as Electronic Arts plans to bring Mirror's Edge to the iPhone April 12th. Once again, you step into the running shoes of Faith, a nimble hottie who works as a runner, delivering secret information to folks living in an unnamed city ruled by an illiberal democracy, thanks to November riots that occurred 18 years ago. Under constant surveillance, these citizens employ runners like Faith as a way to fight back against the regime, and instead of grabbing machine guns and filling soldiers full of holes, these couriers live on rooftops and have mastered the art of the quick escape, the basis for the video game. 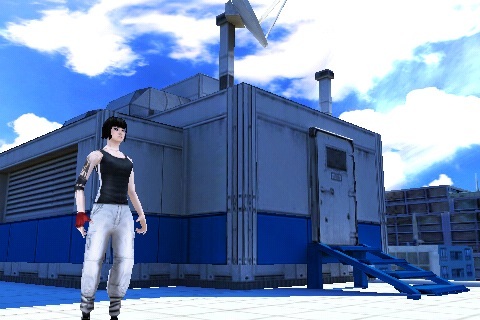 Mirror's Edge on the iPhone is all about running from enemies and looking great doing it. The goal is to successfully maneuver Faith from point A to point B while racking up lots of points along the way. And while she and the city were modeled in glorious 3-D, the game plays more like a 2-D effort, with Faith running from left to right. Thanks to the touch screen, EA was able to make everything gesture based. To make Faith fun forward, simply swipe the screen. If she approaches an obstacle, swiping up instructs her to jump, while swiping down makes her slide underneath things. In addition, physically tilting the device while she's on a slope will cause her to slow down or speed up, depending on how you hold the iPhone. Levels tend to be fairly huge, so EA put lots of save points so you won't restart at the beginning. From what we've seen, you'll need plenty of help if you intend to clear large gaps and escape from an attack chopper (armed with machine gun, of course). On the positive side, you should have a blast playing this game. Not only do the controls work, but Mirror's Edge also looks great in motion, as EA nailed Faith's animations and the city, with tall skyscrapers covered in glass set against a clear blue sky. We're also glad that the developers included Time Trials, one of Xbox 360/PS3 version's most appealing features. These missions remove the enemies and allow you to focus primarily on running for the best time possible, and global leaderboards let you compare your score with other players'. Thus far, we love everything about Mirror's Edge. The iPhone version retains the spirit of the original game, while including cool touch screen controls that give us an all new way to experience the series. Cross your fingers and hope that EA prices it accordingly, and always remember to look before Faith leaps.